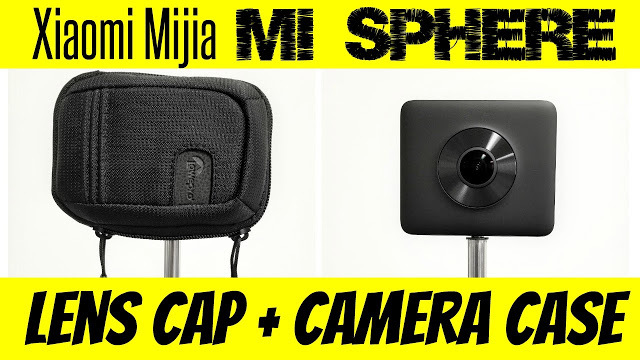 I found a camera case that fits the Xiaomi Mi Sphere perfectly and doubles as a lens cap! Like any 360 camera, you need to take very good care of the Xiaomi Mi Sphere’s lenses. Unlike non-360 lenses, scratches will have a serious impact on the image quality of 360 lenses because of their very short focal length. The Xiaomi does include a camera case, which has a rubberized texture that seems waterproof. However, I wasn’t satisfied with it for two reasons: first, it’s not that thick, and doesn’t seem like it will protect the Xiaomi in case you drop it. Second, every time I take the Xiaomi out of the case, I see that the lens is smeared. It seems like the rubberized texture has some kind of oil in it (perhaps to prevent it from drying out). 1. Can fit the Xiaomi horizontally or vertically. I can put my Xiaomi with the 1/4-20 tripod insert exposed, so I can attach my Benro MK10 selfie stick tripod any time, while keeping the Xiaomi in its case until I’m ready to shoot. 2. Is very thickly padded for protection. Originally, I was looking into a crushproof hard case, but if the case is rigid, then the impact from a fall will transmit the shock to the camera and possibly crack the lens, defeating the purpose of having a case. 3. Wearable. I can put the case on my belt. It also comes with a shoulder strap if you want to use that. This Remote Shutter works good with this camera? Hi Wendel. There is no remote shutter yet for this camera. Any recommended cases that fit in 2018? oh i see. Well maybe you can go to your local camera or electronics store and ask them if they have anything similar to it.